I usually go to work pretty late, unless I have a morning audition, so I don't really have to get up super early. Joshua likes his space in the morning and prefer to be alone to do all his routines. Taking a shower, ironing his shirts, water the plants around the apartment and have a slow start to his morning without having to talk to anyone. I get up the second he's out the door. I'll go grab my juice, get Balder under the covers and look at my emails in bed. I'll hang out there for a while before taking the dog for a morning walk. After that I do work by the desk. 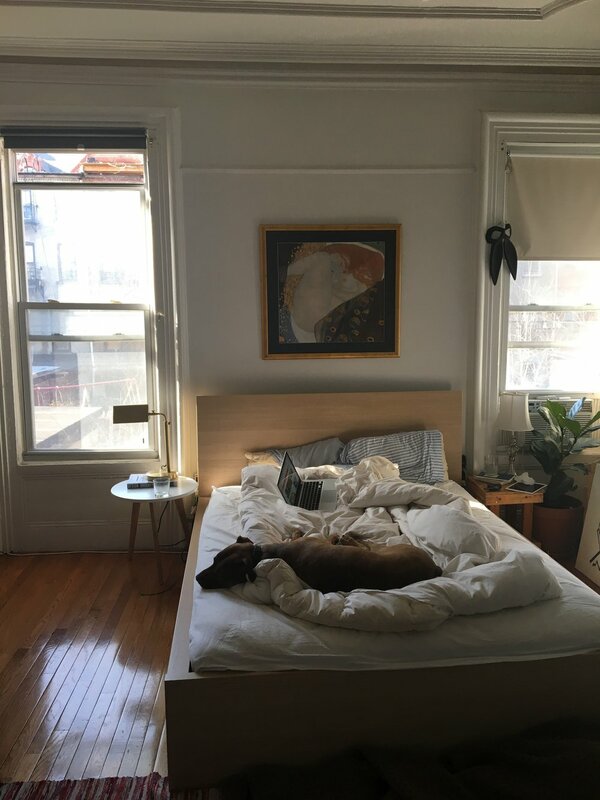 The best mornings are when the sun is out, and the apartment is filled with sun, everything is so sincere and calm. The coffee usually taste better then and the workflow is more satisfying. Having the time in the morning to make french press coffee, gather your thoughts, plan the day and not rush out is one of the things I'm spoiled with. So in the weekends when we're both off from work Josh still gets up before me to walk the dog and to get donuts, bread and coffee for breakfast. Especially during the warm season this is now almost a tradition. We don't go out for brunch very often, we don't really start the day until noon and we like to spend our mornings together, alone.